Various forms of partnering - such as officially registered marriages, cohabiting relationships, and other kinds of relatively stable relationships - are crucial in the formation of families throughout the world. Although, today, forms of partnering in the region are not restricted to formal marriage, the norm remains for couples to marry - to establish a new family, and to accept the cultural requirement to have children. 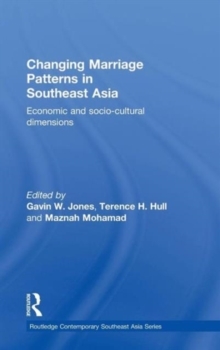 This book provides a comprehensive and up-to-date picture of partnerships and marriage in the Southeast Asian region using quantitative data alongside qualitative approaches.Through the research of demographers, sociologists and anthropologists, it examines the way trends in the formation and dissolution of marriages are related to changes in the region's economy and society; illuminating both the broad forces affecting marriage patterns and the way these forces work out at the individual and family level. Presenting the variety of contemporary marriage patterns in the region, with an emphasis on the ways in which marriage issues impinge on the welfare of those concerned, this book will be essential reading for students and scholars of Southeast Asia and the sociology of the family.